Order your copy of "Six Colts, Two Weeks - Volume 2"
A masterpiece! In Six Colts, Two Weeks, celebrated equestrian author, Tom Moates, walks the reader through the once-in-a-lifetime experience of attending a colt starting clinic with renowned horsemanship clinician, Harry Whitney. "This was...no ordinary clinic," Moates says in the introduction. "This...would be an extraordinary, singular opportunity to learn from a renowned horseman in a way that may never happen again." This new title (Volume One) covers the first week. The longest of Moates's eight horse books to date with 290 pages and more than 100 photos, Six Colts, Two Weeks, is a unique memoir that documents how Whitney goes about preventing young horses from developing "people problems" in the first place. Come along for the fun, challenges, and one-of-a-kind insights from Whitney recounted with inquisitiveness, astuteness, and humor as only Tom Moates can do. Six Colts, Two Weeks is destined to be a modern equestrian classic that no horse library is complete without. Order your copy of "Six Colts, Two Weeks"
This much anticipated fifth title in the Journey Into Honest Horsemanship Series includes more adventures from many of the usual suspects--Dinky the Mule, Jubal, Festus, Niji and others are back to add their part in the next installment of Tom's ongoing horsemanship journey. 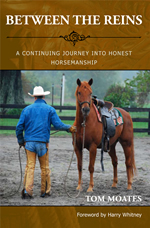 The book also shares quite a bit about Tom's "Passing It On"--that is, sharing with others what he's been blessed to learn from horseman, Harry Whitney. Harry has written a foreword for the book, and as always, it is packed with great photos. Pre-Orders are greatly appreciated because they help to gauge the size of the initial print run. The book is expected to begin shipping in early July. All pre-orders are given top priority when the book is released. 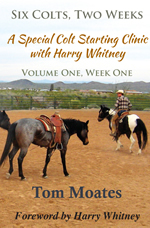 Order your copy of "Passing It On"
Tom Moates continues his journey into better horsemanship with the patient guidance of his mentor and friend, renowned clinician, Harry Whitney, in this fourth book of the series which follows A Horse's Thought, Between the Reins, and Further Along the Trail. Jubal and other regulars return, and meet newcomers like Mister Dinky the Mule, as new challenges abound. Ride along as Tom crosses 1500 miles of the west with Harry attending clinics and seeing first hand his life on the road. Enjoy another stretch of this ongoing, epic trail as Tom learns new horsemanship lessons and is constantly Going Somewhere! 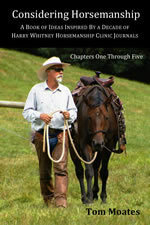 Order your copy of "Going Somewhere"
A Continuing Journey into Honest Horsemanship "
Equestrian journalist and author, Tom Moates, is back with more chronicles of his earnest attempts to improve his horsemanship skills with the tolerant guidance of renowned horsemanship clinician, Harry Whitney. This follow up to A Horse’s Thought contains fresh equine adventures and insights as Moates tirelessly pursues to understand Whitney’s uncanny ability to see things from the horse’s point of view. Whether riding at home in Virginia’s Blue Ridge Mountains, traveling to audit Whitney’s clinics in various states, or getting bucked off again while riding in a clinic himself--vital lessons unfold in these pages as Moates increasingly comes to a deeper understanding of horses and what goes on in that space Between the Reins. 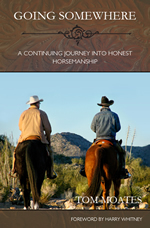 Order your copy of "Between the Reins - A Continuing Journey into Honest Horsemanship"
"In his 2006 book Discovering Natural Horsemanship, writer Tom Moates wrote of his quest to better understand the equine mindset and develop a true horse-rider partnership. His 2009 follow-up, A Horse's Thought, chronicled his efforts to implement into his riding the teachings of clinician Harry Whitney, who has since become a mentor to Moates. 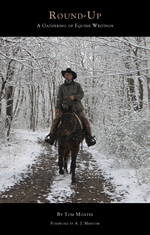 In Between the Reins, Moates continues his ongoing journey toward horsemanship enlightenment, sharing lessons learned while riding with Whitney and during horseback excursions into the Blue Ridge Mountains of Virginia, Moates's home state. Containing 12 chapters and a foreword by Whitney, Between the Reins tells the story of a horseman who has survived the introductory phases of an equestrian education, and is now venturing forward, past the clichés of the clinic scene, in an effort to see the world from a horse's point of view. A skilled storyteller and gifted writer, Moates's ongoing contributions to the equestrian literary canon make for inspiring reading." Tom's latest book is an extremely rare written glimpse into implementing the teachings of renowned clinician, Harry Whitney. Tom Moates’s popular writings exploring his personal exploits with Niji, Sokeri, and other horses, as he sincerely attempts to improve his horsemanship skills with Whitney’s patient guidance, are regular features in Eclectic-Horseman and America’s Horse magazines. This book combines an abundance of new, previously unpublished material regarding this ongoing odyssey, with recently expanded and updated essays from the magazine series. Inquisitive as always, Moates applies his familiar candid and plainspoken style to probe the depths of very difficult aspects of horsemanship. The results are sometimes wrecks, occasionally triumphs, but always enlightening...and a lot safer experienced on the page! Read one of the chapters from A Horse's Thought "The Myth of Natural Horsemanship" that ran in Eclectic Horseman Magazine online here or download as a PDF. A Horse's Thought also is available as an e-book for all e-readers and can be purchased at most e-books stores. Round-Up: A Gathering of Equine Writings, is a compilation of articles and essays by equestrian journalist and author, Tom Moates. Renowned for his inquisitive nature and unconventional approach to the full-time pursuit of exceptional horse based stories, this award winning writer has more then 350 published articles to his credit. In this, his fourth horse-based book, Moates compiles twenty of the most notable of those equestrian works. The majority of the stories originally ran in magazines such as America’s Horse, Eclectic-Horseman, Equus, The American Quarter Horse Journal, and Western Horseman. A couple previously unpublished works are included as well. Remarkable horses and horse folk alike from an almost insanely wide spectrum of experiences are profiled in this compilation. From tremendous horseback adventures measured in the thousands of miles by such people as notable novelist, Douglas Preston, and Olympic medalist, David O’Connor, to the retirement of Joe, a beloved and long time Professional Bull Riders (PBR) pick up horse, to interviews with ranch women, Texas day work cowboys, Hollywood horse wranglers, and a vet pioneering innovative wound healing technology—Moates covers all this and more, now rounded up between two covers in: Round-Up: A Gathering of Equine Writings. 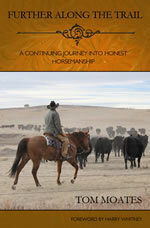 Discovering Natural Horsemanship chronicles one man’s obsession to get better with horses in a gentle way. Author Tom Moates’s life and work were on a horseless path until serendipity brought Niji, a sorrel gelding, into his life. Nothing has been the same since. In his candid and plain-speaking style, Moates shares the honest highs and lows that come with the territory of starting out in the Better Way with horses. Along the road, many well known clinicians—including Harry Whitney, Bryan Neubert, Linda Parelli, John Lyons, and Ray Hunt—generously tolerate his thirst for helpful information on getting better with horses, and Moates works hard to share their wise words in this book, alongside his personal experiences attempting to implement them. 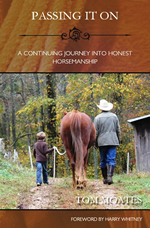 Sometimes humorous, often inspiring, and always resonating with authenticity, Discovering Natural Horsemanship is an awesome read for anyone who loves a great true story, whether horses have knocked you from the regular orbit of your life, or not . . . yet.